Sev & Dust consists of Sev Statik and DJ Dust. Hence, Sev & Dust. Sev Statik is an emcee best known for his solo work (on such albums as Speak Life and Slow Burn) as well as his contributions to hip-hop collectives Deepspace5 and The Tunnel Rats. DJ Dust is the Producer/DJ for Mars Ill, known for generating some of the finest hip-hop out of Atlanta for over five years now. 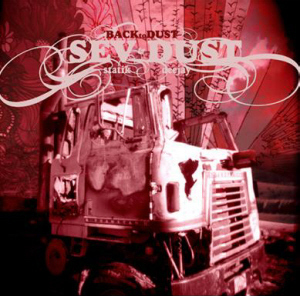 Musically, Dust is all over the place on Back To Dust. Instrumentation on the beats is diverse and extremely strong - from deftly played mandolins, flutes, and pianos to some extremely grimy synthesizers to some ambient recordings of dolphins; each beat stands unique. They range from the quirky "Let It Go" to the brooding "Unborn" to the feel-good "Far Cry" to the driven and brain-punctuating "The Gods" and cover all shades in-between. Elements of the trademark Dust sound still abound: clever sampling of mid-to-late 1900's rock, jazz, and blues show up all over the place, as well as snippets of preaching that sound like they were pulled off a very well-worn analog tape deck. The soundscape is consistently well-layered when it fits the song, but conversely is quite minimalistic and simple when called for also. Both complexity and minimalism are pulled of masterfully. Production values are top notch also, with Dust bringing his breadth of experience from working on a continuing deluge of Mars Ill and Deepspace5 records over the past few years to the table. Everything sounds crisp and the mix is beyond ideal - vocals are clear and distinct (always a plus on a rap record), and at the same time none of the beauty in the complexities and intricacies of the music is lost. Another thing to note is the drums. All instrumental layering aside, if you were to strip the album down to the basic drums that serve as the foundation to each song, you'd find that the high quality of the record filters down even to that basic structural level. There's a wide variety of drumkits used in the sequencing, and all bear the touch of a master not only in terms of which set to use, but also in how they are used within tracks. One needs only listen to "Steamroller" once paying particular attention to the drums to get a flawless example of how this basic excellence underlies the whole album. Beats alone, this is without question one of the strongest hiphop records I have ever laid ears on. One evident advantage of using only one producer is that despite the diversity of sound from track to track, there is a cohesive feel to the record that really binds it all into one. Ultimately though, the whole thing is on point - pulsating regardless of pace, incredibly tight, and utterly well executed. With such a strong backbone permeating every musical facet of the record, the only remaining place it could really fall apart is in the lyrical content and vocal delivery. Fall apart, it does not. On Back To Dust, Sev Statik has delivered his best performance to date. While past appearances hinted at the strength shown on this record, such as his track "Disposable" on The Tunnel Rats' 2004 self-titled release, it is on Back To Dust that listeners can see Sev at the current peak of his work. The album's title references Genesis 3:19, in which God reminds Adam that just as he was created out of dust, so to dust he will return one day when he dies. Lyrical content throughout the fourteen tracks seem to revolve around the concepts suggested this reference; highlighting life, death, creation, and a mesh of interconnected ideas. Never one to back down from making truth statements that might brush some people the wrong way, Sev comes out with an onslaught of well-crafted verses without ever losing sight of his priorities or the core concepts which drive the album. By means of example, the first song on the record, "Altitude", is a meditation on the current state of affairs in Western society, from the perils of mass media brainwashing to the myriad problems facing today's families. This meditation is coupled with dosages of encouragement to the listener to rise above the often dismal realities that surround them and take moral and spiritual flight in the midst of chaos. This sets the stage well, as much of the album is informed by this preoccupation with overcoming difficulty and surpassing perceived limitations and expectations. Further, the necessity of obtaining outside help (particularly the holistic and spiritual aid of Christ) to accomplish these things as we prepare for and anticipate our eventual return to dust is another common thread. To make a strong album stronger, every guest on the record nails their appearance. With visits from such underground mainstays as Manchild from Mars Ill, Playdough, Griffin and Raphi from Tunnel Rats, Theory Hazit, LMNO, Cas Metha, Supastition, and Relic... there's no shortage of excellent thoughts and voices to share them. None of the guests steals the spotlight from Sev, but neither does any of them come through with anything less than a stellar verse. Also of note are the occasional spoken-word or acapella portions that chase a few of the tracks, which are both interesting and well presented.